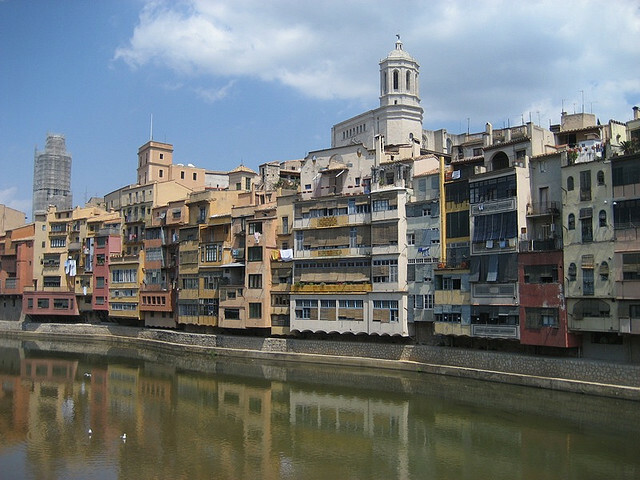 The medieval Catalan city of Girona lies 90km north of Barcelona. It serves as a gateway to the popular holiday resorts of the Costa Brava as well as being the arrival point for many budget airline passengers heading for Barcelona. Girona is an ideal destination for a short break in its own right, especially when combined with visits to Figueres to see the world famous Salvador Dalí Museum and to the quaint seaside village of Cadaques where the artist lived and worked for many years. The majority of arrivals at Girona airport either hop on buses that take them to their hotels along the Costa Brava or travel directly to Barcelona city without spending any time in Girona. On the one hand this restricts tourism to the city but on the other it allows Girona to hang on to its undoubted charm without suffering the scourge of mass tourism. Girona-Costa Brava Airport lies just 12km southwest of the city of Girona. It is well served by flights from the UK, especially Ryanair whose decision to make Girona Airport one of its European hubs certainly put this provincial airport on the map. Nowadays almost 3 million passengers go through its terminal every year. On arrival there’s a ‘Barcelonabus’ waiting to take passengers into Barcelona as well as local services operated by Sagalés which offer frequent services to Girona bus station. From the bus station you can walk to most of the city’s main sights and central hotels or take one of the waiting taxis. We tend to stay at the modern Hotel Carlemany on Plaça Miquel Santalo which is only a five minute walk from the bus station and allows us to visit all of Girona’s main attractions on foot. Be warned that some budget operators refer to the airport as Barcelona (Girona) which has confused more than a few passengers as the airport is about 90km from the city of Barcelona. If you’re using Girona airport as a gateway to Barcelona then do bear in mind that the cheaper fares involved in getting to Girona may be offset by the costs of transfers from Girona airport to the Catalan capital. And that’s not taking into account the time spent transferring between the cities. If you want to fly directly to the city of Barcelona then you need to look for flights to Barcelona El Prat Airport which is located just 12km from the city centre. If you’re simply heading into Girona from the airport there are plenty taxis available as well as an airport bus which goes to Girona’s central bus and train station. By Bus to Barcelona: From Girona airport there is a Barcelona Bus running to the centre of Barcelona (70 minutes) which operates immediately after flight arrivals. This service is run by a local bus company called Sagalés who sell E-tickets on their website. Buses are NOT provided by Ryanair (as some passengers seem to think) so don’t assume that a Ryanair flight will wait for you if you are on this bus heading back for Girona, it wont! Their timetable also appears online. Look for “Barcelonabus” in the parking near the airport terminal to use this service. Sagalés also offer services into Girona city. Once you arrive in the Barcelona’s main bus terminal, Estació del Nord (Carrer d’Ali Bei 80) you can walk about 10 minutes to the Arc De Triomf metro station from where you can travel anywhere in the city. By Train to Barcelona: An alternative is to head into Girona by bus or taxi then take one of the frequent trains that run to Barcelona Sants station. You can find train timetables for the Girona to Barcelona train route in English on the RENFE Website. A taxi into Girona takes about 30 minutes. Girona Airport Car Rental: Girona is an easy destination from which to collect a rental car and drive to the Costa Brava without any traffic problems. However, it isn’t worthwhile driving into Barcelona because of the traffic problems you’ll run into and the overnight cost of parking. Zest Car Rental are highly recommended for rentals from Girona Airport. You can get a live quote from the search box below. 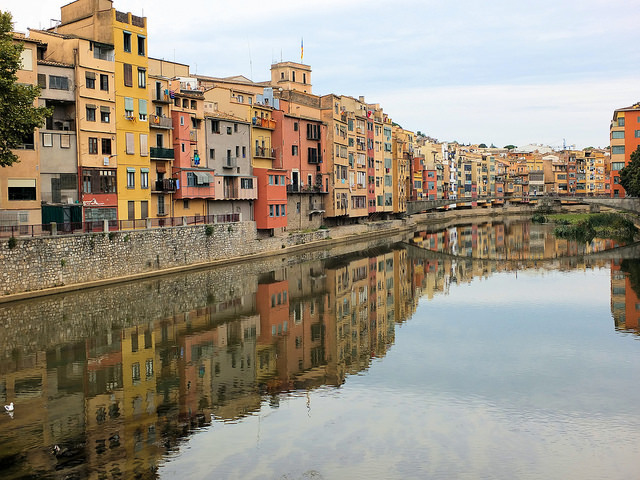 Girona is a city which is often overlooked by tourists in their haste to get to the coast or to Barcelona. Yet it is an atmospheric city with a beautiful historic area and plenty of restaurants and tapas bars waiting to be explored. Some things you should consider when selecting a hotel in Girona is whether you want proximity to the city or whether you might want to be a short distance from the city centre but have the availability of a pool and gardens to relax in. Below we’ve suggested a few of our preferred Girona hotels. The 4 star Hotel Carlemany is a clean and modern hotel located in the centre of Girona near to both the old and new areas of the city. The rooms are all comfortable and spacious with some looking on to an inner patio. They are all soundproofed and air conditioned and have satellite TV, a safe, a mini bar and hairdryer. There is an a la carte restaurant and a cocktail bar and free internet access for guests. The staff are friendly ad helpful and speak English. This is a modern 4 star hotel located in a narrow street in the centre of Girona in a perfect area for exploring the old part of town. The facilities in this hotel are first class and all the rooms come equipped with TV, hairdryer, free mini-bar with soft drinks, safety deposit boxes and many other details. There is very good double glazing in the windows which block out all the noise from the surrounding streets. The hotel restaurant is excellent and you would be well advised to book a table in advance as it is a great favourite with both hotel guests and locals alike and often has to turn customers away. The staff speak very good English and are very friendly and helpful. The Costabella Sercotel is a modern and efficient 3-star hotel located at a 5 min drive from the centre of Girona. All of the rooms have views, satellite TV and internet access. Amongst the excellent facilities offered by this hotel are an outdoor swimming pool, a fitness centre, sauna and jacuzzi. There are also bicycles available at no charge. The restaurant provides a substantial buffet breakfast and a la carte in the evening. The River Onyar winds its way through the heart of the old city with multicoloured apartments looking down on it. Take a stroll across one of the many bridges into the labyrinth of streets that make up what is one of Spain’s best preserved Jewish Quarters. You can walk along the city walls which gives you a great view across the city and towards the Pyrenees mountains in the distance then visit the magnificent Catalan Gothic cathedral which was the site of a mosque under Moorish rule. The Arab baths near the cathedral are well worth a visit as is the Iglesia de San Félix and the fascinating Museum of Jewish History. Ask about the ‘Tiquet M5’ as you pay to enter your first museum you visit as it will give you reduced entrance fees in the others. There’s a tourist information office on the eastern bank of the river across the Pont de Pedra bridge at Rambla de la Llibertat,1. Pick up your maps and information there then take a stroll along La Rambla which is the social centre of the old town where you’ll find plenty stylish shops and some nice cafés from where to sit and watch the world go by. Wandering around the old streets of the ‘Call’ (Jewish Quarter) you’ll stumble upon a fine selection of stylish bars and restaurants offering fine evening dining and good value ‘menús del día’ at lunchtime. On the other side of the river Plaça Independència is a personal favourite where you’ll find numerous bars and restaurants with outside terraces. It is home to Casa Marieta whose origins can be traced back to 1892 making it the oldest restauarnt in Girona. Dedicated lovers of the finest restaurants should make bookings well in advance of their visit at the incredible El Celler de Can Roca (Can Sunyer 48) which holds three Michelin stars. Creative Catalan cuisine has led to its being voted the best restaurant in the world. The other major cultural attraction of the region is the town of Figueres which lies 42km north of Girona. This was the birthplace of the much revered Catalan artist Salvador Dalí and is home to the Teatre-Museu Salvador Dalí which houses many of his major works. Figueres is well connected to both Girona and Barcelona by road and rail. 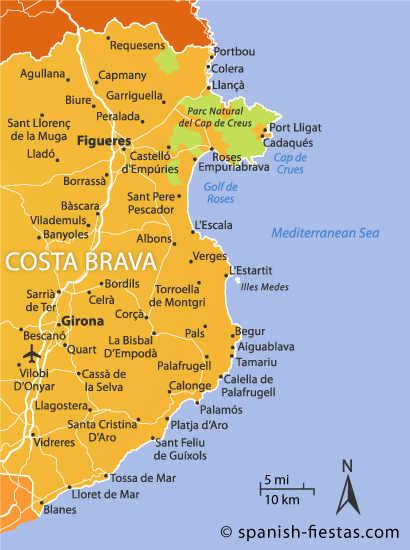 Spain’s Costa Brava (“rugged coast”) stretches from the French border to Blanes some 60km north of Barcelona in the province of Girona. Along with the Costa Blanca and Costa del Sol it is one of the Spanish mainland’s three main areas of mass package tourism. Lloret de Mar with its excellent beaches and varied entertainment has traditionally been the focal point for mainly British tourists looking for the stereotypical sangria and chips summer holiday. Other less tacky resorts such as l’Estartit and Tossa de Mar are firm favourites with foreigners and Spaniards alike whilst a drive down from Roses to Tossa de Mar will reveal some attractive little towns such as Pals, Begur, Tamariu, Calella, Llafranc and Aigua Blava which are a far cry from the big resorts. Recognition of the natural beauty of the Costa Brava and the cultural attractions of the area is growing rapidly as the region seeks to redefine its mass tourism image. Scuba diving is popular along this coast thanks to some first class diving sites such as the Illes Medes just off L’Estartit where there is reckoned to be the most diverse sea life of the whole Spanish coastline. Opportunities abound inland for walkers and cyclists, indeed this is one of the main training area for professional cycling teams. And for skiers, Spain’s finest slopes are just a few kilometers away from Girona in the mountains of the Pyrenees.